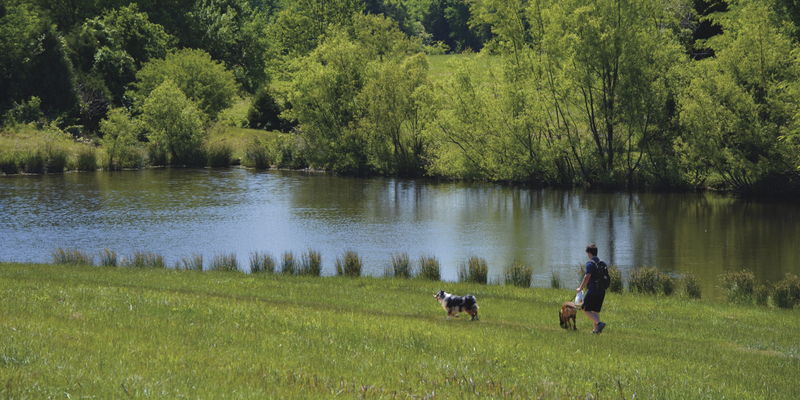 While dogs are welcome on-leash at Shelby Farms Park and Shelby Farms Greenline, the Park also offers more than 100 acres of open fields, lakes and unpaved trails for off-leash fun in The Outback Off-Leash Dog Park! The Outback Off-Leash Dog Park is open daily from sunrise to sunset and provides more than 100 acres of area designated for off-leash activities for you and your four-legged pal. The Outback is generously sponsored by Jim Keras Subaru. It's dog tested + dog approved. Looking for other ways to celebrate your pup? Honor or remember a favorite pet with a personalized dog tag that hangs on a special sign in the Outback Off-Leash Dog Park. They come in a variety of shapes and colors! Find out more here. Honor or remember a favorite pet with a paver stone. These special stones are located the Outback Off-Leash Dog Park. Find out more here. Looking for cool gifts for your four-legged friend? Head over to the Lake's Edge Gift Shop in the First Tennessee Foundation Visitor Center where you'll find toys, water bowls and more! Classes including obedience and socialization are offered in this special series for furry friends. Find out more here.